Geniet van een zorgeloze afsluiting van uw vakantie in Mexico-stad met een privétransfer van uw hotel naar Mexico City International Airport (ook bekend als Benito Juarez International Airport). Reis in de ruimte en het comfort van een privévoertuig en sla de gedeelde shuttles over. Deze transportservice is 24 uur per dag, zeven dagen per week beschikbaar. Bij het maken van een boeking voor deze enkele reis, dient u alle details van uw aankomst en het adres van uw accommodatie te vermelden. Uw transfer wordt onmiddellijk bevestigd en u ontvangt een reischeque om aan de chauffeur te presenteren. Op het door u aangegeven tijdstip haalt uw privéchauffeur u op bij uw centraal gelegen hotel in Mexico-Stad en neemt u comfort mee naar Mexico City International Airport. Leun achterover en geniet van de privacy en royale beenruimte terwijl u rechtstreeks naar de luchthaven reist. 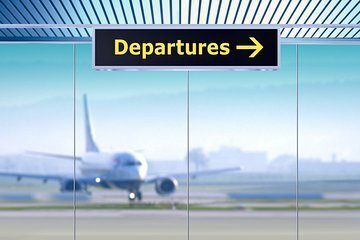 Zonder vertragingen bij het ophalen van andere passagiers komt u op tijd op de luchthaven aan voor uw vlucht en eindigt uw vakantie zonder stress. Prijs is per persoon, gebaseerd op 3 volwassenen per voertuig. Good and helpful driver got us to the Mexico City Airport at the right time for our morning flight. We wanted to depart the hotel at a later time but the driver insisted on arriving at the earlier time, and it is a good thing he did so. By the time we got through the slow and crowded check-in line, we just had enough time to make it to the gate. Good thing he came at the earlier time! had to wait for about 20 minutes for car and driver to show up, buts met by Amigo tours representative outside customs with our name on the placard. The traffic in Mexico City is crazy so will give him a pass. arrived on time had a sign with my name on it and was very helpful. made what could have been stressful very worry free. Had a little trouble finding our coordinator and getting a car, but once the ride commenced, it was fine. Great service, our pick up was at the hotel exactly the time that we wanted to be picked up! Definitely recommended to everyone. It took us an hour plus to get through immigration very early in the morning, but the host and driver were still waiting for us as we entered the terminal from customs and got us to the hotel in comfort . Excellent service. Driver arrived at hotel right on time and was polite and helpful. This was excellent. He was waiting for me at exactly when I requested to be picked up and we got to the airport safety and easily. The only confusion for me was I didn't know when I was supposed to be picked up originally. I had to email them and request a time. They replied very promptly, but it would be a bit better if they would proactively email me first to get the ball rolling.